NAOSH Safety Week: Our Operations Manager jumped right in and demonstrated how the eyewash station should be used in case of an emergency. In the Shop: Safety and Orientation – Safety starts at home! We started off Safety Awareness Week with our install crew showing us all of the safety equipment and safety protocols to follow for everyone going into our shop, warehouse, and showroom. In the Client’s Work Site: Safety with Install Crew – injuries aren’t an option! Our install crew talked about being onsite, the dangers they encounter, certifications they have, their new PPE pack, and how the biggest safety problem they encounter isn’t a lack of training or equipment – it’s other personnel wandering into their work zone. At the Office: Office Health – You’re sitting all wrong! Ergonomics in the office, how to stay healthy at your desk and avoid the pains and aches that sometimes creep into a person’s life when working at a computer all day long. At the Office: Our Fire Plan – our protocols for an emergency at our head office. 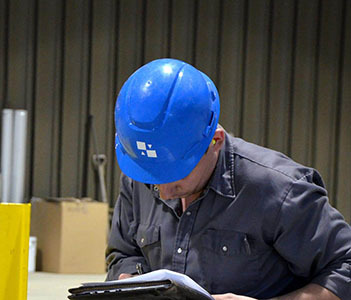 In the Client’s Work Site: Adapting and Embracing client Safety protocols – Our sales staff are often guests on client sites for inspections, measurements, and consultations. They are familiar with many organizations different requirements and always bring their own PPE to use on site. Fun Fact: to maintain a professional appearance they wear special dress shoes with steel toes and a puncture resistant insole.